Brazil v Germany, played on 8 July 2014, was an association football match played between Brazil and Germany in the semi-finals of the 2014 FIFA World Cup. Germany's 7–1 win was the largest in FIFA World Cup semi-final history. To some, it became known as the Miracle of Belo Horizonte. To others it was called the Mineirazo or "Mineiraço", comparing it with the famous "Maracanazo", in which Brazil lost an important game against Uruguay in the 1950 World Cup. The team met for the second time in World Cup history, with the first game being the 2002 FIFA World Cup final. In the previous game against Colombia, Neymar suffered a fractured vertebra and Thiago Silva was banned due to him getting too many yellow cards in the tournament. 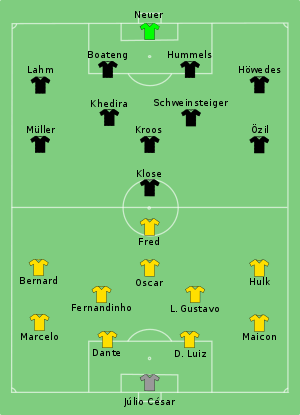 Wikimedia Commons has media related to Brazil and Germany match at the FIFA World Cup 2014-07-08. ↑ Emmet Malone (8 July 2014). "No redemption as Brazil humiliated by Germany". The Irish Times. Retrieved 10 July 2014. ↑ Jack Lang (8 July 2014). "Brazil's tragedy: Mineiraço will haunt emotional World Cup hosts for years to come". Mirror Online. Retrieved 10 July 2014. This page was last changed on 4 September 2018, at 09:39.